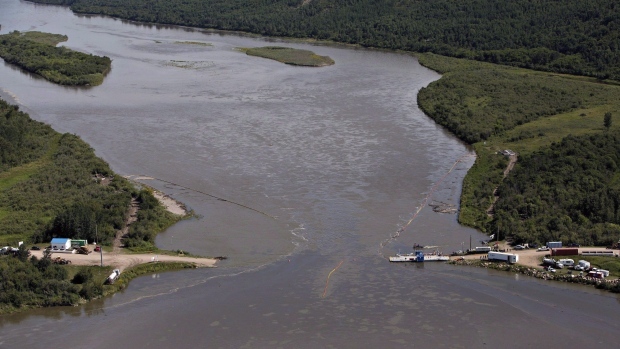 REGINA - A government spokesman says cleanup of an oil spill along the North Saskatchewan River will be put on hold due to an anticipated rise in water levels. Wes Kotyk with the Saskatchewan Environment Ministry says heavy rainfall in Alberta means water flows are expected to rise up to two metres starting this weekend. But Kotyk says there's enough time to complete the shore cleanup before the water starts to freeze in October. The government says that there have been 144 confirmed wildlife deaths, including 51 aquatic species, since a Husky Energy (HSE.TO) pipeline leaked last month near Maidstone, Sask. Meanwhile, the province's Water Security Agency says one sample out of 120 taken from the river did not meet drinking water guidelines. That sample was taken five centimetres below the surface of the river at North Battleford.